Having been around slightly over 20 years, Forest River is far from the most seasoned RV manufacturers in the United States. Despite the fact that they are a relatively “young” company, Forest River has managed to thrive in the USA through quality craftsmanship and innovative building techniques and included accessories. Forest River has done so well in fact, they have absorbed a number of other manufacturers with more experience, in order to not only improve their products, but the previously existing products from the brands that joined the Forest River family as well. Their success not only helps to ensure that Forest River RVs are built using industry leading techniques and materials, but the multiple nationwide manufacturing facilities allow engineers the time to perfect their build without being rushed by shipping time concerns. Not many would consider calling themselves a “FROG”, but the craftsmanship behind Forest River RVs has inspired owners to do just that. To be a FROG aka a member of the Forest River Owners Group, simply take the words that form the FROG acronym literally, meaning if you own a Forest River RV you can become a member. While it may seem insignificant upon first glance, many “FROGs” have formed lifelong friendships and gained valuable information about vacation destinations from those that may have already explored the area you are interested in. 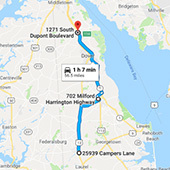 At Delmarva RV Center we take pride in our work and go out our way to ensure EXCELLENT customer service. We carry both new and used Forest River RVs with a variety of floorplans and models on hand or available for order. Our service technicians are expertly trained and operate our multiple manufacturer authorized service facility. Whether you are looking for a quality Forest River Motorhome, Forest River Toy Hauler, Forest River Fifth Wheel, Forest River Travel Trailer, Forest River Destination Trailer or a Forest River Camping Trailer, we will make sure you find the Forest River RV that suits all of your needs!